(3BL Media / theCSRfeed) New York - February 2, 2012 - Anvil Knitwear Inc, a leading manufacturer of sustainable apparel, is being considered in the 2012 TED Ads Worth Spreading challenge, an initiative to recognize and reward innovation in advertising. The digital short, “Message From Earth: Organic Matters,” was created to educate consumers to choose and farmers to grow organic, as well as draw a connection between what we wear and the environmental and social repercussions it has on the world. 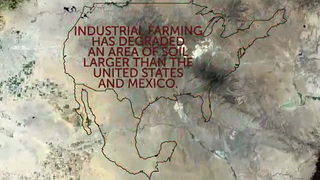 The thought provoking video sheds light on the consequences of conventional farming, such as pesticide poisoning to farmers and water contamination caused by chemical application for pest/weed management. Earth narrates the story and proves a point: “Your appetite and lifestyle is destroying me, yet you are the solution.” Message from Earth empowers the viewer to support organic farming through their individual purchasing decisions, connecting the dots from what we wear, how the fiber is grown and how one person can be a change agent by choosing organic. “Awareness is the first step. There’s now a strong correlation to what we eat and how it is grown. Our goal is to open eyes within the fashion and apparel industry and link the fiber in our clothes to the process of how it’s grown. More awareness means more demand. As a result, more farmers will be inspired to convert to natural farming methods and ecosystems will be restored to its natural state,” noted Caterina Conti, EVP at Anvil. As the largest domestic purchaser of certified U.S grown organic cotton and transitional cotton (three year period to become certified organic), Anvil is using its leadership platform in the sustainable apparel industry to raise awareness for the power of individual purchasing decisions to bring about change in the farming and fashion industries. In 2010, Anvil launched the Double It! campaign with a goal of doubling the amount of US organic cotton acreage. Double It! is an initiative to support U.S organic farmers and restore land back to its natural state, free of chemicals used to treat pest and weed management. Anvil Knitwear, Inc., a century old apparel brand, is a leader in the sustainable apparel industry with its AnvilOrganic® and AnvilSustainable™ brands. AnvilOrganic® has been ranked in the top ten largest organic programs worldwide by the Textile Exchange for the last three years. In addition to sustainable apparel, Anvil focuses on consumer education via interactive platforms, including www.TrackMyT.com, which chronicles the life cycle of a t-shirt from seed to store. For more information, please visit www.anvilknitwear.com.